The history of textile manufacturing in eastern Connecticut is well documented. The industry’s narratives are replete with stories emphasizing the importance of water power, mechanization, and the impact that demand for labor had on local communities. What often gets lost among the tales of mass production are the subtle methods that distinguished one manufacturer’s textiles from the next. 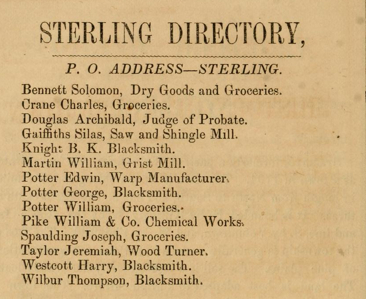 Identifying a product made by the Pike family of Sterling, Connecticut, however, is often just a matter of black and white. 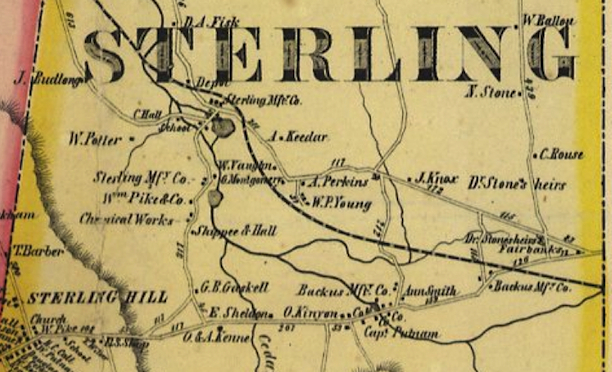 In 1810, William Pike left his home in Sturbridge, Massachusetts, to settle in Sterling. His father was a hat maker who taught him the art of coloring fabric and these skills helped William land a job in the dye house at the Sterling Manufacturing Company. The following year, William took charge of the entire dye house operation. One of the many challenges facing textile manufacturers during this time was finding a way to produce bright white fabrics. Accepted practices called for bleaching cloth in the sun. William Pike revolutionized these practices by pioneering the use of chlorine to bleach fabrics white. It soon became the new industry standard. In addition to his innovative whitening techniques, Pike experimented with wood distillation to extract the first pyroligneous acid (also called “wood vinegar”) produced in the United States. Decades later, he looked to his only surviving son, James, to carry on the family’s industrial legacy. James was born in Sterling on December 31, 1826. He attended Plainfield Academy before joining his father to make chemicals at the Sterling Manufacturing Company. What his father did for the production of white cloth James soon did for black, developing a revolutionary process that allowed fabric to maintain a more permanent black color without fading. James went on to become a prominent member of the Sterling community, holding a variety of town offices and serving in the state legislature. James’s son, James Edward Pike, attended Brown University before returning to Sterling to join his father in the acid business. 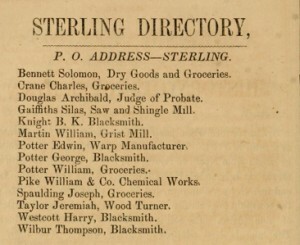 James Edward, in turn, had a son, Edward, who grew up in Sterling and also went to work in the dyeing and finishing industry. The Pike family’s prominent role in dyeing and finishing cloth in Sterling began coming to a close, however, with the United States Dye and Finishing Company’s purchase of the Sterling Dyeing and Finishing Company in 1901. After the sale, James Edward Pike left for Niantic, Rhode Island, where he launched the Niantic Dyeing Company—a business he operated until his death in 1910. Edward stayed with US Dye and Finishing for 14 years but resigned in 1916 due to declining health. He retired to Plainfield, effectively bringing an end to the family’s 100-year run of leadership in local textile and dye manufacturing. “Catalog Record of the Pike Family Personal and Business Papers, 1785-1917.” Connecticut Historical Society Library Catalog, 2014. Link. Lincoln, Allen Bennett. A Modern History of Windham County, Connecticut: A Windham County Treasure Book. Chicago, IL: S.J. Clarke Publishing Company, 1920. “William C. Pike.” Plainfield Souvenir, n.d. Link.